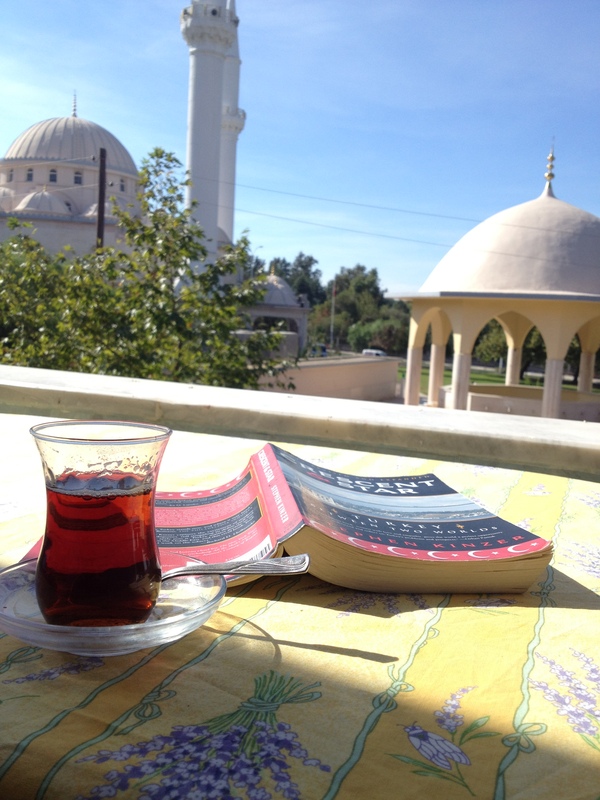 I meant to go into more detail about tea drinking customs in Turkey some time back, but honestly it’s become such a regular part of my daily life I hardly think about it anymore. Or, you could say I think about it all the time. It is now expected. If too much time passes between tulip-shaped glasses of tea, I start to wonder. What’s going on with this day? It’s not a caffeine addiction (though the caffeine does help). It’s just the act of sitting and sipping a steaming glass of tea that is now an integral part of every day. At home, preparing it—having it simmering on the stove—is half the pleasure. No meal is complete without a glass or two of tea to finish it off. Tea here just is. But, I realize this is not familiar to some. 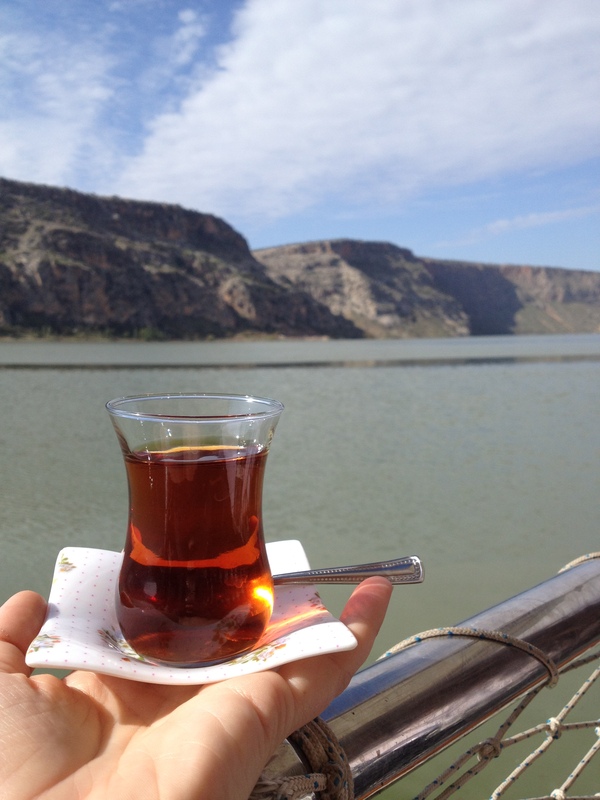 One piece of advice I was given about living in Turkey is to take time to take tea, particularly with people who are a part of your daily life. Don’t take them or your relationship for granted. I happen to enjoy keeping up with people. 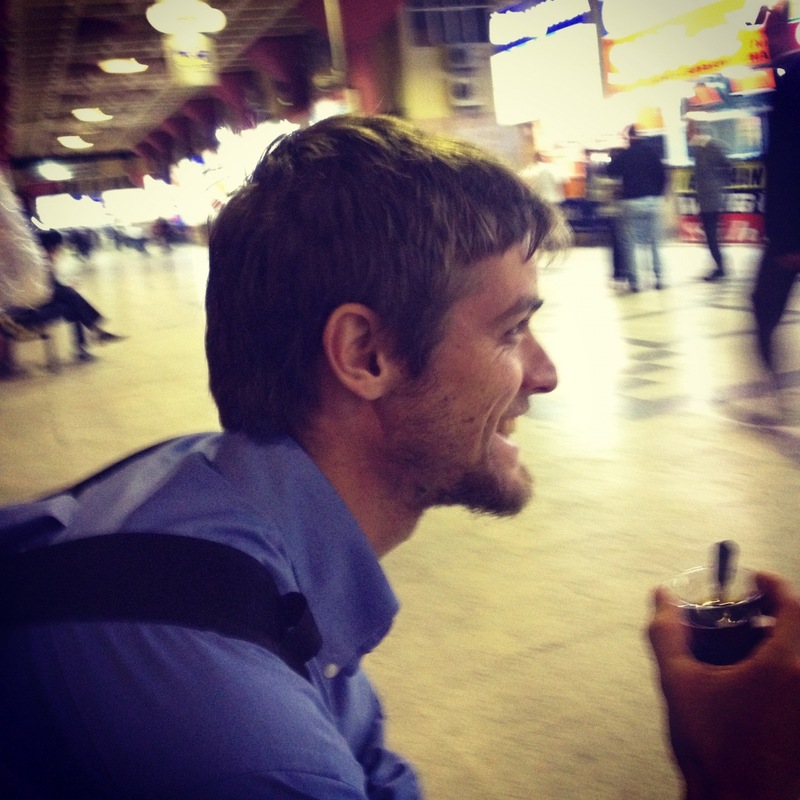 I have made friends who now live all over the world, and are doing many different things. We might not be able to relate to each other’s professions or family lifestyle, but we continue to learn from each other. Though I find it relatively easy and fulfilling to keep up with friends through the virtual world, on a daily basis spending time sitting, chatting, sipping is not really embedded in American culture. There is too much else to do, too much to accomplish. This might include social media or communicating in other ways, but I find it is hard for us to just sit with others, especially if we don’t have an extremely close relationship or don’t have business to settle. Though there is also a coffee drinking culture in the US, the best way Americans sit and chat with each other seems to be with a cold beverage, and often the outcome involves some degree of tipsiness. 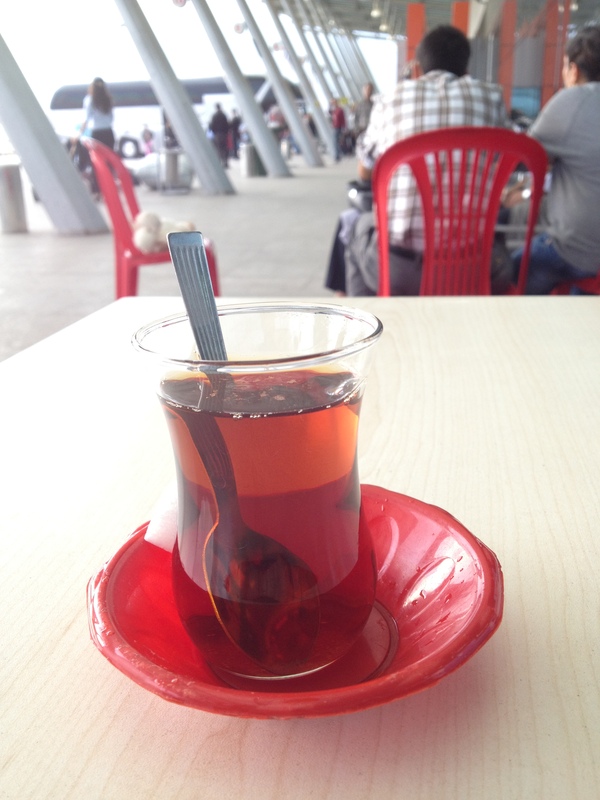 So what is Turkish tea? How is it brewed? How is it served? 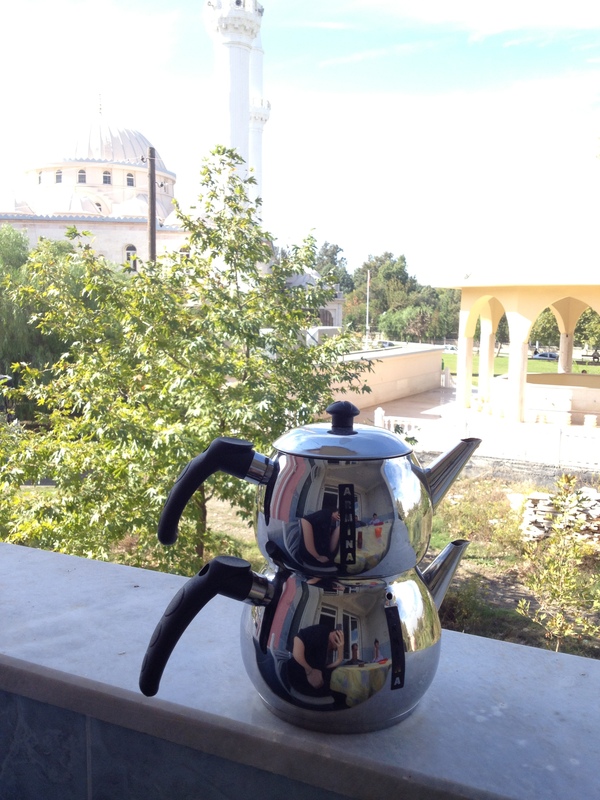 To make a traditional pot of Turkish tea, one should first obtain a double boiler tea pot (çaydanlık) and loose black tea (though tea bags are acceptable these days and less of a mess…). After rinsing to remove any lingering dust, put several scoops of black tea leaves in the top kettle, and fill the bottom larger kettle with water. Place the pot on the hot stove top and wait for it to boil. Once it does, fill the top kettle with boiling water, pouring it over the tea leaves. Add more water to the bottom kettle so there will be plenty of water, hot and ready once the tea is prepared, and place the kettle with tea leaves back on top for it to steep over the steam. After about ten minutes, the tea should be ready for pouring. 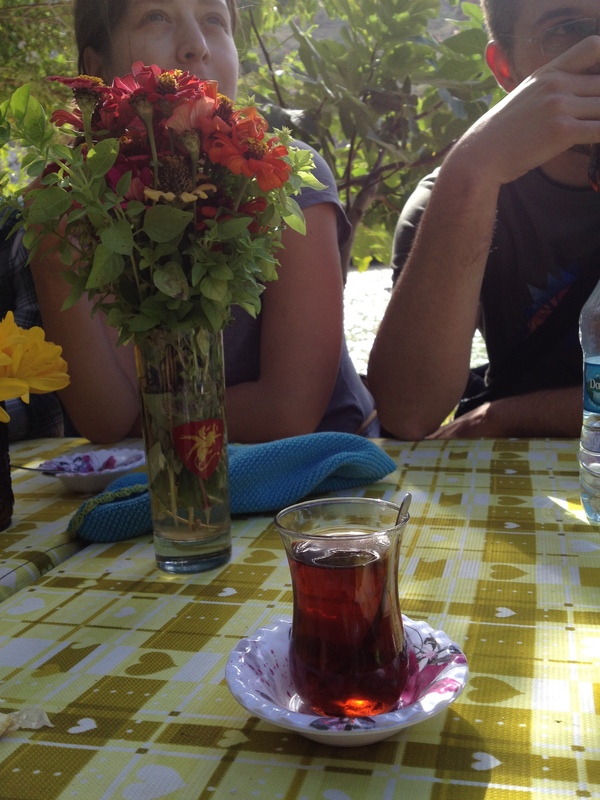 The only proper way to take tea in Turkey is in a tulip-shaped glass. Though these can vary a bit in size, the glass is able to fit in the palm of your hand. Yes, at first it’s rather hot, and you should take care to hold it by the lips of the glass as to not burn your fingers. 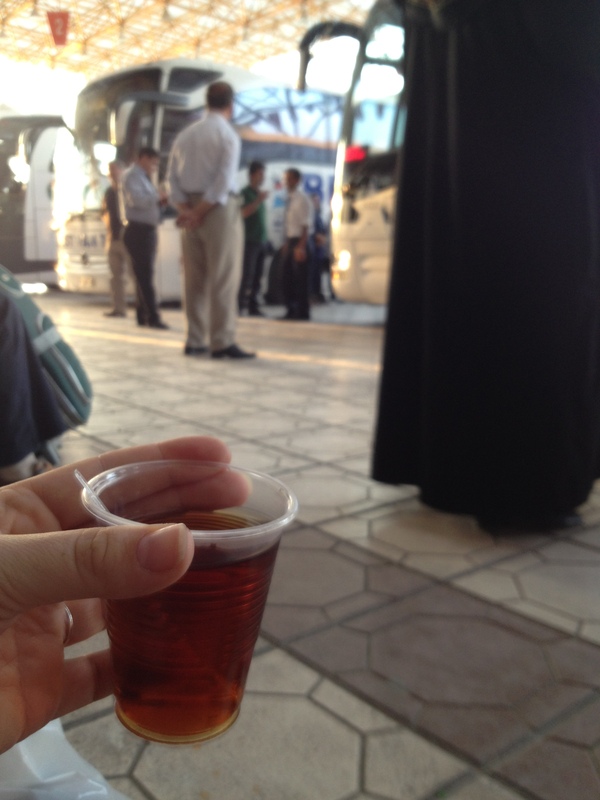 But after a while—even after the tea has been consumed and the glass is empty—the glass remains warm. It’s a lovely comforting feeling to warm your hands with your tea glass. When pouring, one should fill the glass with the strong tea brew up through the lower hips of the glass. This should be diluted with boiling water from the lower teapot. NEVER add sugar when serving tea. Instead, provide a bowl of sugar cubes, or place two cubes next to the glass on the saucer, along with a teaspoon. 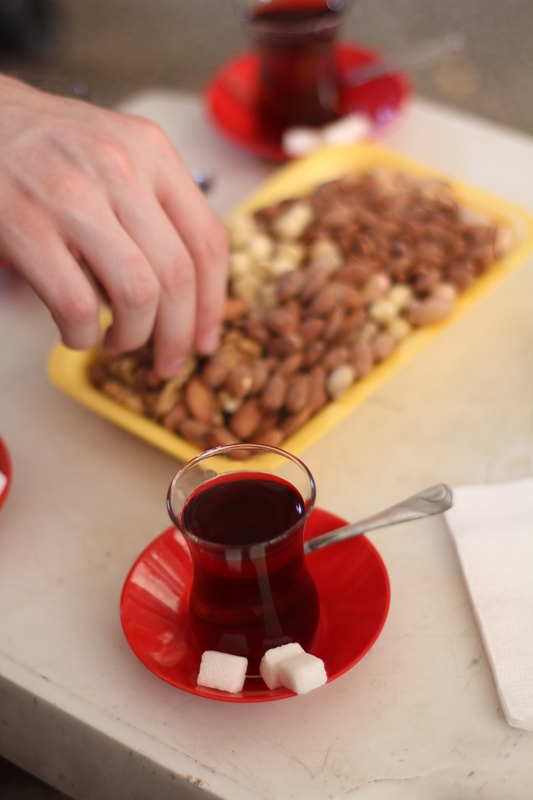 Unlike Turkish coffee, in which the sugar is added during the preparation, each person adds their desired amount of sugar on their own. 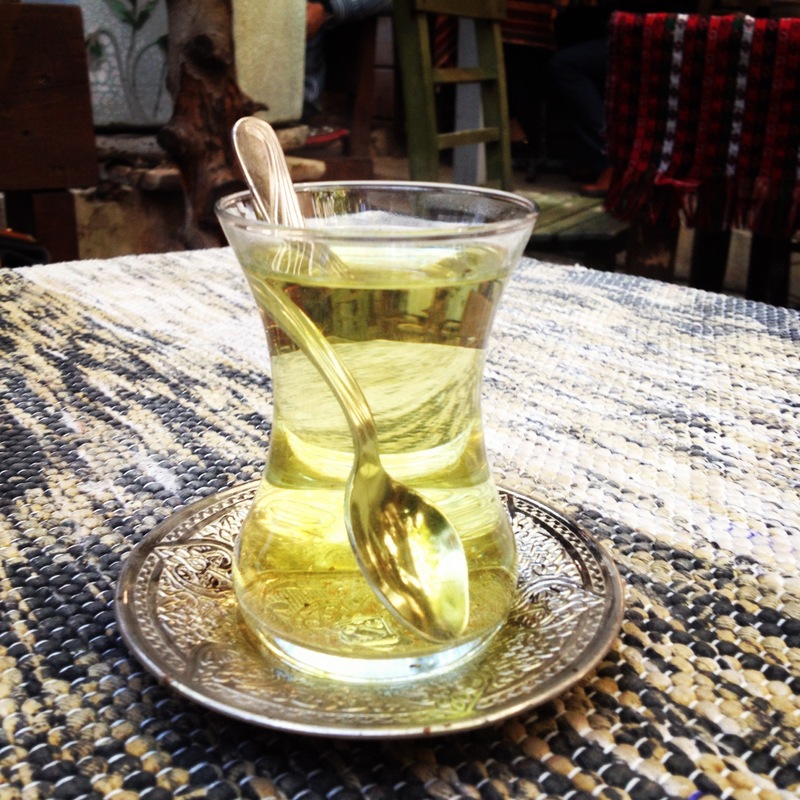 Turks do not hold back, and a loud tinkling from the spoon stirring to dissolve the sugar can be heard up to 30 seconds after tea has been served. I will admit at first I found this rather irritating, but have now become quite amused by this racket. Once the first glass is gone, there will most likely be several more to follow. 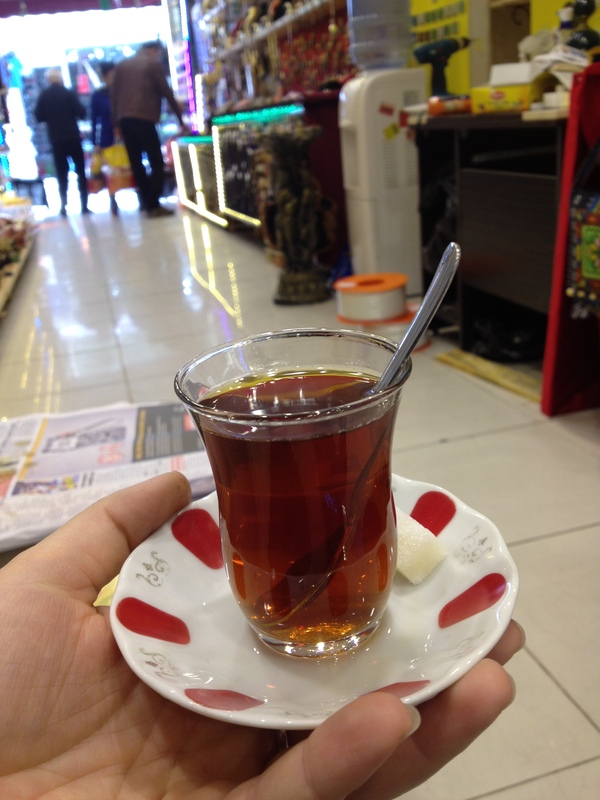 You can be sure you will get your fill of tea in Turkey, whether it is in a store, the post office, a business office, a restaurant, the bus station, on the bus, on the street, in anyone’s home, your hotel, the hospital, or elsewhere. I am grateful I have come to embrace this cultural tradition, and I challenge you to take time out of your day to sit and chat with someone just to do so. Our inter connectivity is what makes the world move, and what makes us more dynamic. It’s easier than ever to stay connected from afar, but make a point to be connected with those around you, too. And you might as well sip tea along the way! 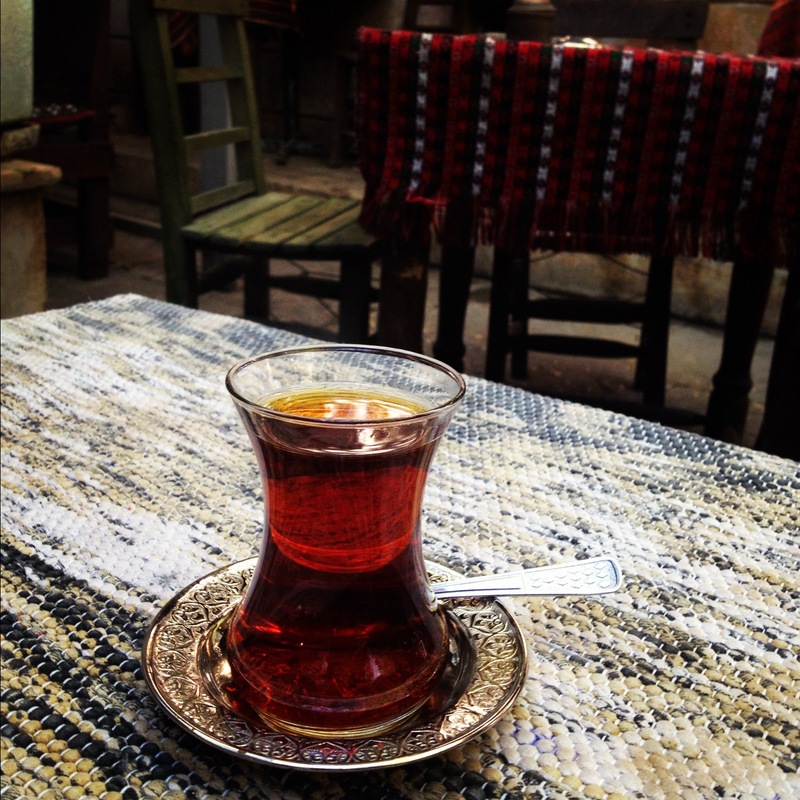 Very cool article I didn’t realize there was such a interesting Turkish tea culture. So true Latasha! one doesn’t take time to chat much anymore, everyone is in such a rush. Growing up, I remember that we always took time to reconnect at the dinner table and especially on sunday. Glad that you are enjoying your stay. Love ya.